Submarine Cable Cutter | Heavy duty subsea cable and umbilical cutting tool for up to 270mm diameter. The HCV270 is a heavy duty submarine cable cutter and umbilical cutter. 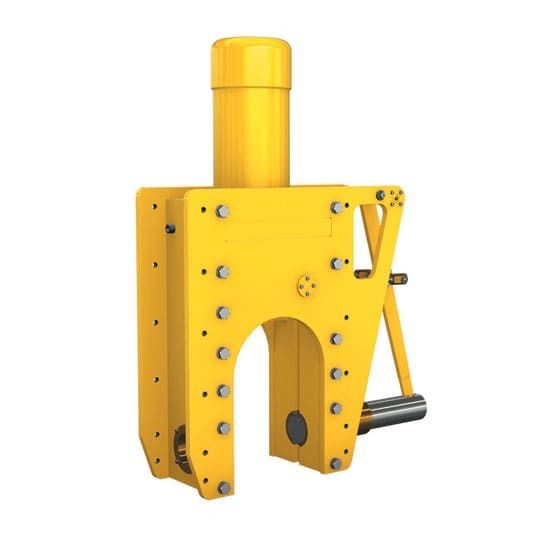 It is designed for subsea deployment in severe working conditions. The integrated hydraulic anvil removes the need for diver intervention and makes the tool easily deployed and operated by ROV. For more information regarding this heavy duty submarine cable cutter please read below! Corrosion resistant and durable coated steel and stainless steel construction. Genuine Webtool™ blades and anvils give the optimum cutting performance and ensure that maintenance is kept to the absolute minimum. The Hydraulically operated anvil makes capturing and severing of the wire rope simple. Mounting holes in the body allow for the fitting of standard handles or bespoke mounting brackets. Serviceability and Support – Spare parts including blades, anvils and seals kits are available. Contact us for technical questions and support. An integrated manifold kit is available. Optional intensifier panel (HP690) is available. Contact our friendly team for more details! You can call us on 01254 615100 or email info@allspeeds.co.uk. Capable of cutting cables, umbilicals and flexible risers up to 270mm (10.6”) in diameter. Hydraulic Supply – 690 bar (10,000 psi) input pressure for the blade. 210 bar (3000 psi) for the anvil. Cutters can be supplied flushed to NAS 6 cleanliness. Swept Volume (Cut Stroke) – 5.3 litres. Swept Volume (Return Stroke) – 2 litres. Cutter weight in air – 375kg. Cutter weight in water – 324kg. For more information please feel free to contact our friendly team! They would be happy help with any questions you have regarding the HCV270 Submarine Cable Cutter, or any of our other products or services. You can also call us on 01254 615100 or email info@allspeeds.co.uk.